The NTFC Supporters’ Trust are holding an open meeting in Northampton town centre on Sunday (March 10). The purpose of the meeting, which will be held at the Park Inn by Radisson hotel (1pm start), is to look into a potential future community ownership of the club. Here, Trust chairman Andy Roberts offers up the reasons why he feels the time is right for such a meeting. “A half century ago, on 11 March 1969, Northampton Town defeated Southport at the old County Ground in front of a crowd of little more than 5,000. The scoreline was 1-0, the goalscorer Phil Neal. An unremarkable match and, on the face of it, an even more unremarkable statistic. Southport have long since disappeared from the Football League landscape. The writing was clearly on the wall for the struggling Sandgrounders in the 1970s - and also smudged on the shirt, courtesy of their centre forward who in a game at the County Ground appeared with the number nine marker pen inked onto the back of his jersey. Irchester lad Phil Neal was later sold to Liverpool for a bargain £60,000 in 1974 and went on to become the most decorated player in English football. And Northampton Town? Well they were relegated to the fourth division of English football in May 1969, so completing their abject fall from grace after a single ‘season in the sun’ battling first division giants in 1965/66. Roll on fifty years, the home ground has changed but little else. The team remains in the fourth tier, attendances remain around 5,000, the ground still has three functioning sides and a lack of ambition prevails. It shouldn’t really be this way. Northampton is a much bigger place than it was in 1969 but home gates have remained the same. The club is not progressing in any meaningful, strategic way and there is a clear disconnect between the club and football fans in the town. Of course, Northampton is also home to a rugby union club playing at the top of its game. A club which has benefited from strong local investment in recent years and one which has adopted a progressive outlook since the sport turned professional. It has captured and retained the town’s floating sports fans for the best part of two decades, a fact that should not be seen as a negative but as an incentive to the association football club up the road. The town of Northampton needs more people coming to watch top-class sport, it needs more people spending their cash in the town and it needs a boost to its visitor economy. Then again of course there are a lot of football fans in Northampton that owe their allegiance to Premier League football clubs or overseas club with a global brand. More often than not, a televisual fantasy. This represents the changing face of football, more and more screen entertainment and less and less a live spectacle. It is a challenge to most league football clubs and one that is not easily overcome. Although some clubs are giving it a bloody good go. The likes of Accrington Stanley, Burton Albion and AFC Wimbledon, to name but three, have all been punching above their weight. As did the Cobblers in 1966, when the late Joe Mercer famously said that ‘the miracle of 1966 was not England winning the World Cup, it was Northampton Town playing in the first division’. However we are now punching well below our weight and, as chairman of the club’s Supporters’ Trust, I feel that this has to change if we are to enthuse and encourage a future generation of supporters. Which is why I am really looking forward to the public meeting on community ownership which we are hosting at the Park Inn in Northampton town centre on Sunday 10 March (1-4pm). The club is not in financial crisis, owners David Bower and Kelvin Thomas have kept things ticking over nicely since the dark days that engulfed us all at the end of the Cardoza reign three years ago. True enough, the team has been in freefall since lifting the League Two championship in 2016. But that can be attributed to a failure of recruitment rather than a shortfall in investment. That being the case, when the garden is still comparatively rosy, why look at community ownership now? To be clear, the public meeting – which will discuss community ownership in English football and explore a potential viable future model for the Cobblers – is not a reflection on the current stewardship at the club. But it is a reaction to the years of stalemate negotiation around development of the stadium and the land surrounding it. The club is unable to progress while this stalemate persists and this is entirely unacceptable. The club is on the market and at some point the present owners will move on. The last outside investment, from Chinese media group 5U Sport, proved to be a disaster for the football club. The Trust is looking to initiate a community ownership model which can be developed into a robust plan, with a vision and direction to implement progress on and off the field via investment in infrastructure. If life-changing investment from outside ever became a realistic prospect, a community-owned club would be in a position to pass the club on, as at Portsmouth. In fact, a community-owned club would could be in and even stronger position for such a deal with stronger governance and infrastructural improvements creating a more attractive proposition. 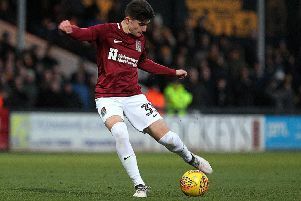 Can there be a better way for Northampton Town in the future? I don’t know for sure but I think the time is right to see what options may be available to the club. If you play a word association game with football fans and say ‘Northampton Town’ they will inevitably say ‘George Best’, a Manchester United and Northern Ireland legend who scored six goals against the Cobblers at the County Ground in an FA Cup tie in 1970. Enough said. Sixfields stadium, built as a community facility in 1994, is in danger of losing sight of this status. The Supporters Trust has just won a long battle to have the stadium and surrounding land listed as an asset of community value. In the last 50 years, the club’s most successful periods came between 1985 and 1990 and then again between 1995 and 2000, when the link between the club and its Northampton community was at its strongest at managerial and board level respectively. The stadium, while marginally increasing its capacity in 25 years, is without a viable East stand and has seen no external expansive infrastructure development in 25 years. The town of Northampton is confronted with clear challenges in terms of its future generation – let us look at a clearly-defined sports strategy for the town, not least for the Sixfields area where some joined-up thinking would be beneficial to improve the sporting, health and wellbeing offer to the people of the town. Northampton Borough Council is likely to be replaced by a unitary authority from next year so the opportunity to build a strong partnership with a new local authority is optimum. The Town’s football, rugby and cricket clubs provide Northampton with a level of sporting excellence that only the cities of London, Manchester and Leicester can presently boast. We have to capitalise on this celestial alignment and, while appreciating the sporting rivalries and cultures of the respective clubs, bring them closer together in a more organised fashion. Last, but by no means least, Northampton Town and its Supporters’ Trust was at the vanguard of the supporter movement in 1992 under the expert guidance of the late Brian Lomax. Wherever Northampton Town goes in the future, it is time to renew and re-enforce those principles on behalf of supporters who are in danger of becoming increasingly disenfranchised. I hope people in Northampton who have the football club’s best interests at heart attend Sunday’s meeting. You may think the idea is a non-starter and unworkable – but please don’t close your mind to the discussion, come along and listen to speakers from Exeter City, Portsmouth and Wycombe Wanderers who have been there and done that. You may come away still unconvinced but at least you will be better informed. It would be lovely if some rich billionaire on a white charger would ride in over the horizon and lift us out of the doldrums. It hasn’t happened to date and it is likely that it won’t happen in the near future, certainly while the club is nearer to the non-league fall out zone than it is to the sunlit Championship uplands. If the Trust decides to pursue a community ownership model for the football club, it will need to attract financial support and raise additional funds. The Trust will only take on a project long term with the required financial planning in place. Strong governance is key and obviously a conversation on funding will be in line with a model deemed suitable for Northampton Town. The club has been on the precipice of oblivion on several occasions in the last 50 years – 1972, 1984, 1992, 2002 and 2015. It would be daft to say that it never will be again. In the mid-eighties, a local journalist Dave Hickey wrote the club’s obituary and ended his article with the throwaway line… ‘If anyone knows a suitable millionaire out there, please ring the club on Northampton 31553.’ A chap called Mick Conroy did know a suitable millionaire, rang the club and in time Watford tobacco merchant Derek Banks became club chairman and steered the club to considerable success in the lower divisions. There may again be potential local investors out there willing to come together with a community ownership vision and we have already been approached in this light. The Trust are aiming to pull the Northamptonshire community together with investment purely for the good of the club for a defined vision. Investment can come from different angles, from individuals or groups.